This anniversary edition of the popular Silver Maple Leaf features a unique design to commemorate the Royal Canadian Mint’s 25th year of production of the coin series. 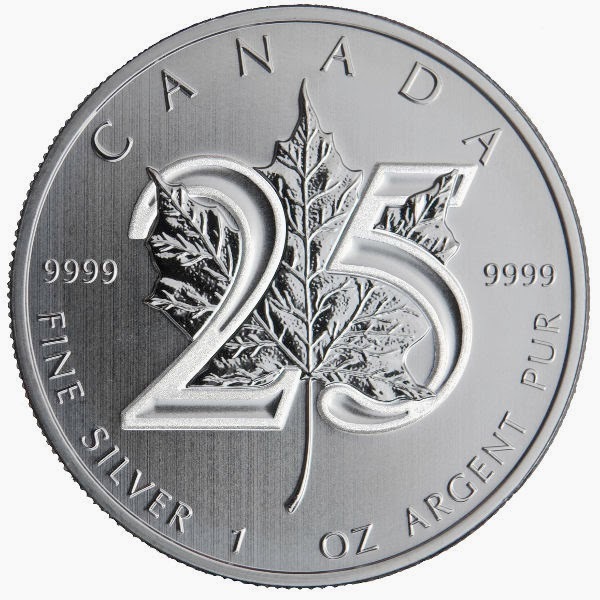 The iconic maple leaf features a “25″ stamped across it to differentiate this design from the normal Silver Maple Leaf. The 25th anniversary edition of the coin ships in mint-sealed tubes of 25, or monster boxes of 500 (20 tubes of 25). The Canadian Maple Leaf is minted by the Royal Canadian Mint since 1988. Obverse shows the typical Canadian Maple Leaf which makes the coin easy to identify. Inverse shows Queen Elisabeth II. The Canadian Maple Leaf is 999.9/1000 pure and is recognised as one of the top investment silver coins worldwide. The Maple Leaf silver coin is denominated with $5 and legal tender in the Canadian Currency and Exchange Act as specified in Part 1 of the schedule to the Act. But the Maple Leaf is not viewed as a coin in circulation as the coin is mainly bought by gold investors and numismatists. 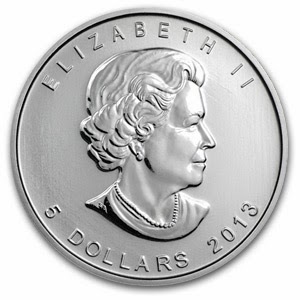 The real value of the Maple Leaf is founded in the content of pure silver which is 31.10 grams for the 1oz coin. Silver Maple Leaf bullion coins are minted at the headquarters of the Royal Canadian Mint in the city centre of Ottawa, the capital of Canada. With BullionVault you can obtain physical bullion bars at current exchange exchange rates. Open your free account today and get 4 g's of free silver as a sign-up bonus.